“I like the feeling of looking through things to a world you can’t quite access, or a residue of a former world that you can’t quite get to, and I try to have that in my paintings”. The balance and symmetry in Keltie Ferris’s paintings makes it tempting to look for underlying grid formations within their layers of colour and varying styles of application. Broad brushstrokes and sprayed on oil paint, are interrupted by patches of smudged colours appear to energise neighbouring, more defined parts of the painted surface, particularly those in 00>><<00 and ((!!!!!)) which resemble the pixels and repetitive shapes found in computer games like Tetris. Ferris’s paintings are inspired by subjects that range from the broken up pixelation of digital images, rubbed out graffiti on New York streets to the glimmering city lights that are visible from her Brooklyn studio at night. She has commented that “bedazzled energy, and bright artificial light” are themes that have filtered into her painting process which explains the underlying, palpable current within her paintings. Ferris started to use spray paint, in order to make gestural, expressive marks that moved on from the physical and historical implications of the traditional brush stroke. 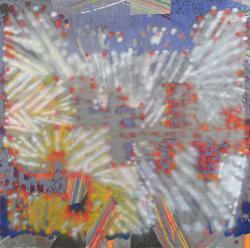 By using thinned consistencies of oil paint sprayed on, rather than an aerosol, she is reproducing the immediacy of a graffiti style mark, and its directness, on the same level that she might reference the hands-off monochromes of Josef Albers or the pictorial, free-wheeling depth found in the paintings of Albert Ohlen. 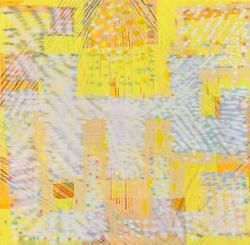 Horton Gallery, New York & Berlin – representing gallery for Keltie Ferris. Selected works and exhibition information. Keltie Ferris' work will be included in the inaugural exhibition It's All American, curated by Haley Mellin and Alex Gartenfeld at New Jersey Museum of Contemporary Art (NJ MOCA), Asbury Park, NJ between the dates of October 24 - January 15th 2011. Keltie Ferris' work will be included in the group show Objective: Abstraction, curated by Scott Grow, at Indianapolis Museum of Contemporary Art, Indianapolis, IN, between the dates of December 3rd 2010 - January 15th 2011. 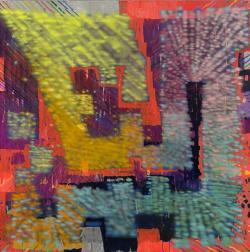 Objective: Abstraction is a group show focused on the diversity in contemporary abstract painting. The exhibition will be presenting works on paper by a diverse group of artists who, each in their own unique way, are exploring the language of abstraction. 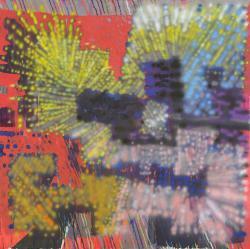 Keltie Ferris is mentioned by Roberta Smith in a review of Spray! At D'Amelio Terras in The New York Times. Keltie Ferris is featured in The Art Newspaper in Artists under 35 at The Armory Show: Keltie Ferris - Bringing back the boogie by Emily Sharpe.